Azienda Tornesi, Biondi Santi Franco, Bartoli Giusti, Castello Romitorio Srl, Il Palazzone, Podere Le Ripi, Fonterenza, Collemattoni, Uccelliera Di Cortonesi Andrea, Sesti - Castello di Argiano, Castello Banfi, Il Paradiso Di Frassina, Tenuta Di Collosorbo Di Giovanna Ciacci, Pieve Santa Restituta and Cupano. 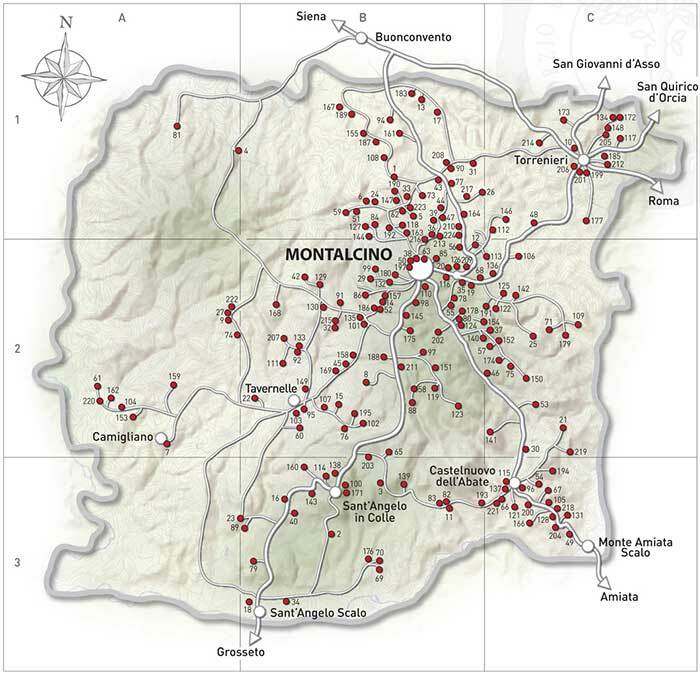 Most of these wineries are situated on the southern slopes of Montalcino. 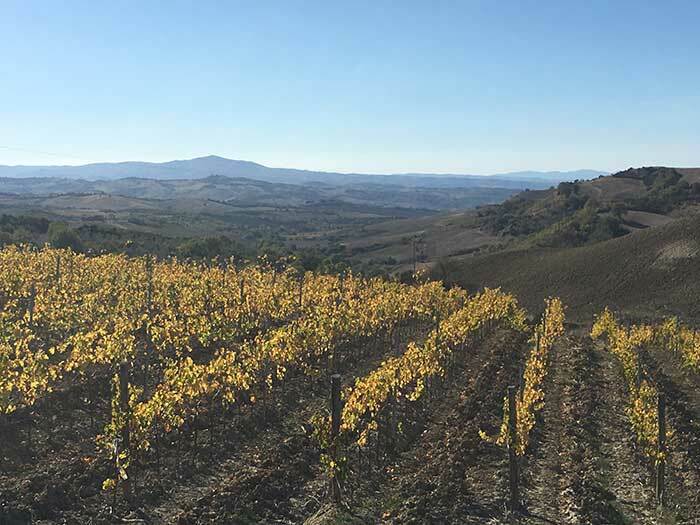 For an exploration of the northern slopes, see Torrenieri, Brunello di Montalcino wineries on the northern-east slopes of Montalcino. Montalcino’s first certified organic estate was San Polino, run by Luigi Fabbro and Katia Nussbaum. On 2.5 hectares of vineyard, surrounded by the wilderness of mediterranean woods and shrubland, this small farm produces a certified organic-biodynamic Brunello di Montalcino and Rosso di Montalcino. Bartoli Giusti is one of the most ancient family of Montalcino. The Bartoli Giusti estate is run by Gino Antonio Focacci and Anna Maria Focacci. Fattoria Bartoli Giusti cultivates 12 hectares of vineyard, situated 300-350 metres above sea level, are planted with Sangiovese grapes. 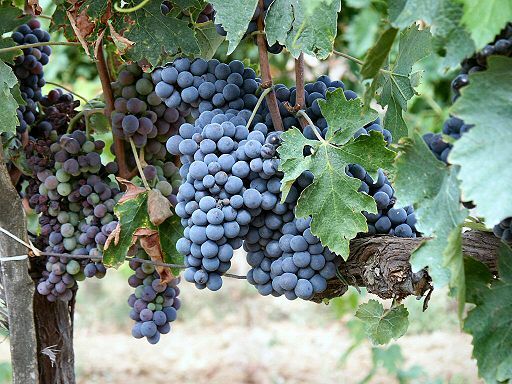 The three wines produced on the estate are those for which the area has achieved worldwide renown: Brunello di Montalcino Riserva DOCG, Brunello di Montalcino DOCG and Rosso di Montalcino DOC. The Pieve Santa Restituta estate was acquired by the Gaja family in 1994. 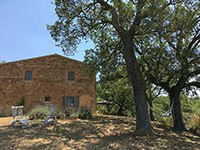 In 1996, the family also purchased the Ca’ Marcanda estate in Bolgheri. Ornella Tondini and Lionello Cousin’s small estate Cupano is situated on a hill facing the confluence of the Orcia and Ombrone valleys, in the southwestern part of the Brunell region. It is one of the finest estates to visit in Montalcino. Area of vineyard: 7ha including 3ha of new plantation on an altitude of 200 m.
Wines: Brunello di Montalcino Riserva DOCG, Brunello di Montalcino DOCG, Rosso di Montalcino 2012 DOC and a Ombrone Sant’Antimo DOC. One of the best places to slow travel in Tuscany is the Maremma, with its exquisite nature, small hillside villages, its epic countryside, cuisine and excellent wines. From here you may embark on a culinary and cultural journey through southern Tuscany. Hikes and walks through the vineyards are accompanied by stunning views of the rolling hills, small vilages and churches. Going wine tasting in Tuscany is practically an obligation in this region of rolling vineyards and hidden, historic wine-properties. Although Podere Santa Pia is off the beaten track it is the ideal choice for those seeking a peaceful, uncontaminated environment, yet still within easy reach of the the famous Tuscan wines.